Following up on my previous post about developing primary source literacy, I want to continue discussing primary sources, the materials that historians use and archivists preserve. Primary sources serve as evidence for the interpretation of past events. Analyzing primary sources will help you to understand how an argument has been constructed and to adopt a more critical stance towards the books and articles that you encounter. Reading an original document or describing an image is daunting, especially when it is historical and originates from a period when attitudes, values, and modes of expression were different from our own. 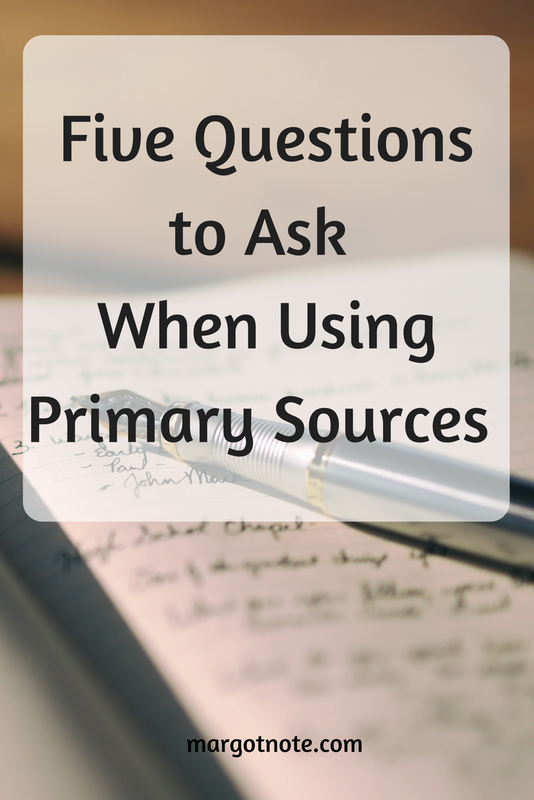 First, consider what kind of primary source document you have. Is it a letter, a newspaper clipping, or a report? Is it a photograph? What technology was used to create it? No matter what kind of document you are dealing with, be as specific as possible about what it is. You must understand the type of historical record it is to proceed to the next set of questions. Consider its authorship. Who wrote, published, photographed, recorded, or otherwise made the document? Sometimes this is straightforward, such as with a letter. The creator is the person who signed it. It can be more complicated than this. Who was the person who wrote the letter? What do you know about their position in regards to the events you are researching? If it is a famous person, answering this secondary question may be easy. But if the person was not well-known, you may have to get clues by doing further research. Figure out when a document was created. It is important to be able to place the creation of the document on a timeline in relation to the events you are researching. Knowing the place a document was created is another aspect of understanding its context. Try to figure out, with as much specifically as possible, where it was created. Once you have tried to determine what the document is, who its creator was, and the time and place of its creation, examine what the document might tell you about the topic you are researching. Read through or listen to the document. What does it say? What information does it provide that you did not know before? Pay attention to what you do not understand or recognize, such as the terms, people, places, and events that are mentioned. Examine it. What is represented? If there are people in the picture, what are they doing? Are they posing for the picture? What is the relationship between the artist or photographer and the subject? What places, buildings, natural surroundings, signs, or other objects are in the picture? What was going on when the picture was created? Note what you do not recognize such as buildings, objects, or people. The questions raised during this process will guide the background research needed to understand the document better. Try to determine the message the document was conveying in its particular time and context. What audience was the creator trying to reach? For what purpose? What do you know about this audience or reader, and how may they have understood the document? Consider the point of view of the creators. What was their stake in making the document? No research project relies on a single source. You will need to examine related documents in the same record series to get more information that will help to put your document in context. If you are doing your research right, these five initial questions will lead to many more queries. Developing analytical skills through primary source interrogation will enable you to appreciate the complexity of historical knowledge, the fragmentary character of the sources from which it is derived, and the provisional and uncertain character of historical explanation.